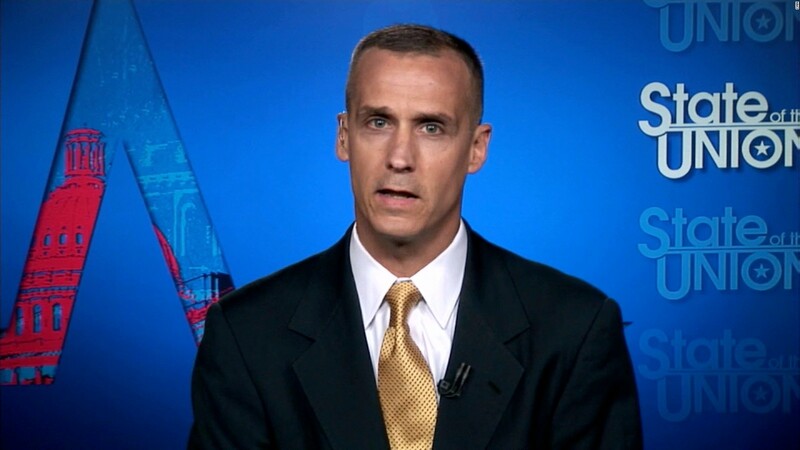 Corey Lewandowski. Photo via CNN. I don’t care that Corey Lewandowski is a partisan hack. And though it bothers me that he was Donald Trump’s thuggish enforcer, I don’t think it disqualifies him from sitting in front of a TV camera and extolling Trump’s alleged virtues. But it does bother me—a lot—that CNN would give a platform to Lewandowski even though he may not be legally free to voice his honest opinion. That’s the least the network should get for the $500,000 it is reportedly paying him. CNN media reporter Brian Stelter wrote about the situation last week and devoted a nine-minute-plus segment to it Sunday on Reliable Sources. Stelter, like Burnett, deserves credit for focusing on what exactly Lewandowski may have signed when he left the Trump campaign. Before Lewandowski’s hiring, CNN already had a pro-Trump commentator in its stable—Jeffrey Lord. And he told Stelter that he saw no difference between Lewandowski signing on with CNN, former George W. Bush consigliore Karl Rove going to work for Fox News, or former Bill Clinton apologist George Stephanopoulos being hired by ABC News. Lord is right—or at least he would be right if it weren’t for the matter of what Lewandowski is legally free to say about his former boss. And you can roll any number of other hired guns into Lord’s critique. What do Democratic operatives Donna Brazile and Paul Begala add to our understanding when they appear on CNN? But such is the nature of political commentary on cable news, whose main imperative is to fill hour after hour as cheaply as possible. Yes, talking heads are cheap, even when they’re well-paid. The sorry truth may be that CNN doesn’t want Lewandowski to criticize Trump even if he’s so inclined. During the 1990s Jeff Cohen, a left-wing media critic, got a tryout to fill the liberal seat on the late, unlamented Crossfire. Cohen didn’t get the job—and one of the reasons, he wrote in his 2006 book Cable News Confidential, was that he was unwilling to go along with a requirement that he defend Clinton come hell or high water. No doubt Lewandowski will settle into his role without all that much additional controversy. Paul Fahri reported in the Washington Post on Monday that rumors of a revolt among CNN staffers had been greatly exaggerated. But something important has been lost, because CNN has gone beyond commentary, beyond partisanship, beyond the mindless recitation of talking points. With Lewandowski, we have no way of knowing whether he’s telling us what he really thinks or if he’s protecting the settlement he signed on his way out of Trump Tower. That may not seem like much in a media environment in which we seem to hit a new low every week. But it’s one more reason why public distrust of the media is so widespread—and why it deserves to be. Oh, give me a break, Peter. In the very article that you’re commenting on, which I doubt you bothered to read, I single out Donna Brazile, Paul Begala, George Stephanopoulous, and Karl Rove as partisan hacks who don’t belong on the air. The list is endless, and of course, I could have added David Axelrod. Jay Carney? He works for Amazon, not CNN. As far as I know, none of them has signed a non-disparagement agreement that legally prevents them from saying what they really think. Which makes Lewandowski unique. Dan, I am commenting on the post you wrote on Media Nation and I am just pointing out that Jay Carney worked at CNN after leaving the White House… . I would imagine there is some paper work involved in leaving that job as well …..
Peter, do you know whether Carney signed a non-disparagement agreement when he left the White House? I’ll bet he didn’t. I laid out in that post very clearly why Lewandowski is unique and criticized partisan commentators of both major parties. Your knee-jerk reaction was to accuse me of liberal bias. Dan, I am not accusing you of a liberal bias, merely pointing it out. By ignoring what I actually wrote.